The Roadster engine is almost identical to the Fortwo engine so the sparkplug changing guide is the same. What does differ is the access. Here is a quick way. more of a pain so here is a far easier way of doing it. Thanks to Ferrina for the information. What Sparkplugs Do I Need? 6x NGK R LKR8A (OEM fitted). 6x NGK R LKR8AP (Platinum) - thanks Neil. You'll need an HT lead remover. The one you can buy from smart is cheap but alright. They sometimes take a bit of bending and reshaping to make them perfect though. Remove the top sparkplug HT leads. Don't pull them by the wires. Use the proper tool. Here you can see how the HT lead remover works. It has tabs that fit under a ridge in the sparkplug connector. With all 3 plugs pulled off of the sparkplugs, fold them back out of the way. 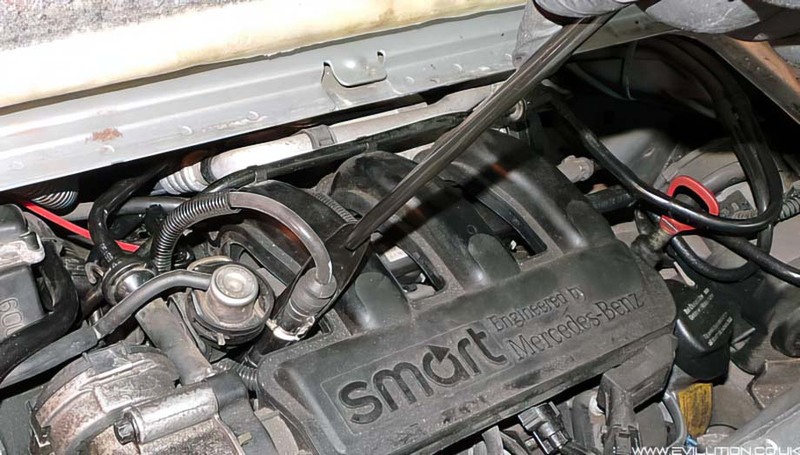 Use a spark plug socket on a ratchet to remove them from the engine. (anti-clockwise). The lower set are the same as before but we are going to cheat on the access. Run a pencil line around the outside edge of the number plate on the right side as you look at it. Then remove rear number plate. Using an electric drill and a 50mm hole cutter (I used one which is used for making stair banister post holes), carefully cut out three holes 10mm inside the pencil line as shown below. ...measure up 35mm from the pencil line. so don't be too worried about getting this spot on. plugs can be removed with very little hassle and replaced with the panel still in situ. and spark plug socket with a universal joint, the easier this job will be. 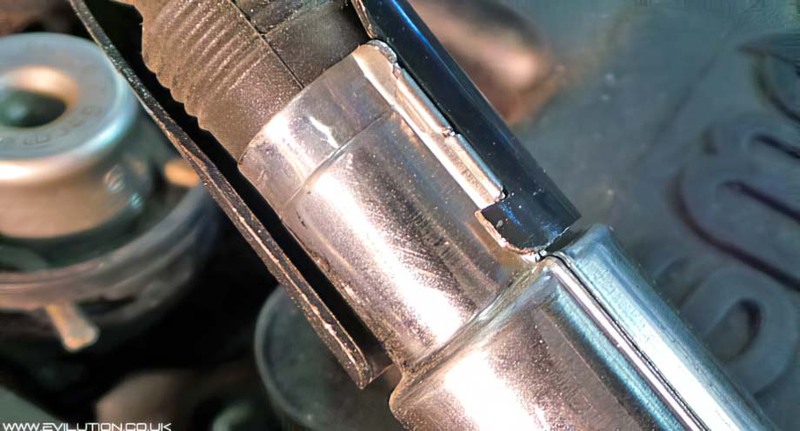 If you wish, apply a small amount of copper grease to the thread (read more at the end). Replace the caps. After sliding them on, a gentle tap may be needed to fully seat them. I used a long screwdriver and placed the tip on top of the plug lead ears. A light tap with the hand is all that’s needed to settle the cap onto the plug properly. All tight? Plug leads on? Press the leads into the slots on the engine to secure them. Replace engine cover. These were my plugs. 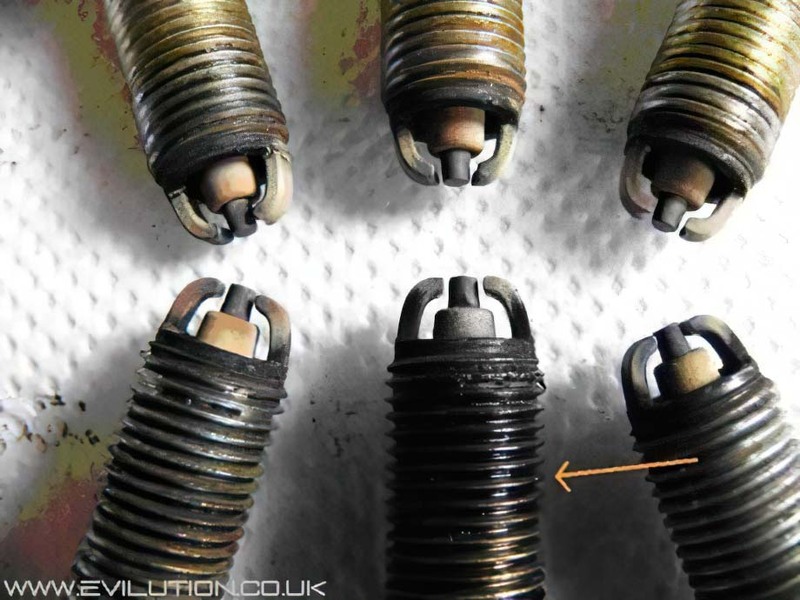 The middle lower plug threads were covered in oily rubbish. being loose and leaking slightly. (Full Mercedes history when the car was bought)! Copper Grease, Yes Or No? remove a plug from a fiesta. Fixing that sort of mess takes time and money. fitting meaning that the plug will turn further before reaching the correct torque figure. so in theory you would not require any copper grease on the thread. An extension to the argument was to use copper grease but to forget the torquing. Instead, the idea is to finger tighten as tight as you can then use the ratchet to give half a turn. This is enough to squash the fire seal ring and is often recommended by manufacturers. There is no right or wrong answer to this, go with what you'd prefer. the number plate could be slightly spaced out from holed panel. This would act as a vent and would allow hot air from the engine and the exhaust to escape the engine bay. Thanks again to Ferrina (Neil) for the information.